Exhibiting at the Game Developer Conference (GDC) in March gave us the rare opportunity to interact—face to face—with a lot of Visual Assist users. Those who visited our booth picked up tips and swag, and left behind terrific feedback. The interactions gave us a better understanding of how Visual Assist is used, and how we could improve an already great product. A few of the improvements are included in Visual Assist build 2270, which is now available. Source Links, introduced last June, was upgraded in build 2270 to support previewing of files whose paths appear in source comments. 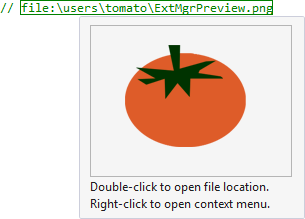 When Source Links and its File Viewer plug-in are enabled, hover over a path to see a preview of the file’s content. Preview-able formats include HTML, XAML, RTF, text, and image formats such as png and jpg. Right+Click any path for file-related options. Find References (Shift+Alt+F) has always been faster and more feature-rich than the built-in equivalent. In build 2270, the feature’s dialog was tweaked to indicate the effect of the filtering toggles D, S, R, and M.
Right+Click in a results window for toggle meanings. Build 2270 continues our suite of improvements for users of Unreal Engine 4 (UE4). In addition to better parsing and coloring, settings related to UE4 are now easily accessed on a new page in the options dialog of Visual Assist. Finally, Code Inspection was moved out-of-process to reduce the memory footprint of Visual Assist, thereby reducing the likelihood of an out-of-memory crash of Visual Studio. Build 2270 requires software maintenance through 2018.04.30. Check out the complete list of what’s new in build 2270, enable the File Viewer plug-in for Source Links, learn to filter results of Find References, or download the installer.